Ilsa (pronounced IL-sah) is a German variant to the No. 11 name in the US, Elizabeth. Other variants of the name include the Hebrew Elsa and the German Ilse. Ilsa means “God’s promise; God is my oath; pledged to God”. The name has never been popular in the US itself. This may be due to the fact that its most notable namesake was Ilsa Lund in ‘Casablanca’ which was released during WW2 and unlike Scarlett, an earlier counterpart for name recognition from a movie, Ilsa never caught on despite the popularity of the film, most likely due to its German origin. 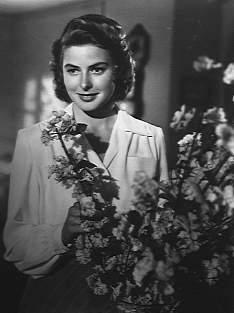 After watching ‘Casablanca’ for the first time tonight (it was a long time coming), I have to say that Ilsa is quite a charming name and interesting variant to the ever classic Elizabeth. It has never charted in the US nor has it been in the Top 10 Female Names in Germany between 1957-2000. It is easy to say that this classic sounding name has never found popularity but with an interest in Old Hollywood Cinema arising in baby names, it would be a delightful choice that would work on both a little kid and a fully fledged romantic lead. Nicknames: Lissie; Lizzie; Ilsie etc.